A huge sign that is portable. You have always enjoyed our custom sandwich boards at your entry. 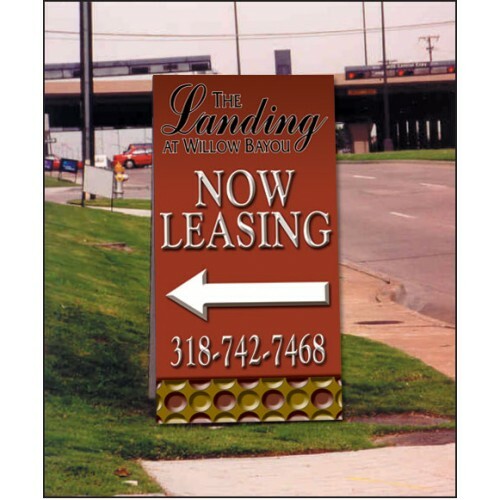 Each double faced sign is constructed of durable MDO wood. We have added new Super Hinges for added strength and convenience. We offer three sizes: 2' x 4', 3' x 6', and 4' x 8'. Choose your choice of color and copy. There is no extra charge for a logo. Digital graphics are now available. A-Frame signs come partially assembled to prevent breakage during shipping. All your maintenance man has to do is simply place the screws in the Super Hinge. Larger signs must ship motor freight. Please call our Marketing Consultants for a quote.